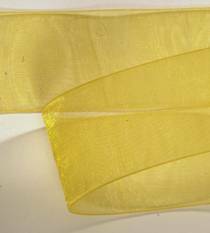 Organdy Ribbon - Bright Yellow. This sheer ribbon has a monofilament edge. Available widths: 1/8", 1/4", 3/8", 5/8", 7/8", 1 1/2", 2 3/4"